Chennai Metropolitan Water Supply and Sewerage Board will going to conduct the CMWSSB Assistant Engineer Exam 2017. 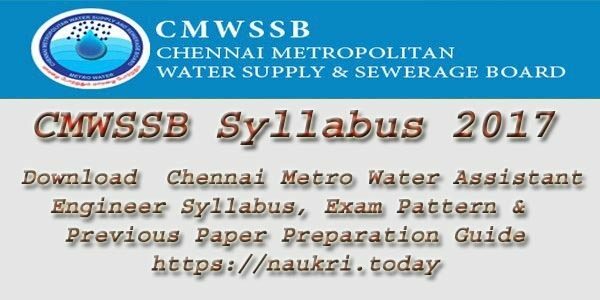 Applicants who have attend this Chennai Metro Water exam can download CMWSSB Syllabus 2017 provided on this page for your preparation. Chennai Metro Water AE Syllabus 2017, Assistant Engineer & JA Exam Pattern and model papers can help you to make perfect preparation for CMWSSB Exam. So, download the CMWSSB Assistant Engineer Syllabus in a pdf format from the direct link provided at the bottom of the article. CMWSSB Recruitment 2017 : Chennai Metropolitan Water Supply and Sewerage Board (CMWSSB) recruitment Notification for 322 AE, JA & Other posts has announced. Candidates who have completed B.E/B.Tech, Any Degree from a recognized Institute are Eligible to apply CMWSSB Recruitment 2017. Online Application Form for CMWSSB Recruitment 2017 is released in official site www.chennaimetrowater.gov.in apply before 06-03-2017. Applicants can also know the further details of CMWSSB notification through the given link. About CMWSSB is Known as Chennai Metropolitan Water Supply and Sewerage Board. CMWSSB is a public sector undertaking run by the government of Tamil Nadu. It is to provide Water supply & sewage treatment to the Chennai City and around areas of Chennai. The Chennai Metro Water Dept. has decided to hire the candidates to fill up 322 vacant positions. Here in this Article we are going to discuss about the CMWSSB Syllabus 2017, Assistant Engineer Exam Pattern in detail against Chennai Metro Water Recruitment 2017. Selection Procedure For CMWSSB Assistant Engineer Exam 2017 : CMWSSB follows two stages of short listing process. Initially applicants will be invited for written test. Based on their performance in this test they will be further allowed to participate in the personal/ oral interview. 65 % weightage for Education Qualification, 25% weightage for marks obtained in the written examination & 10% weightage for personal interview. Scheme Of Examination (Objective Type) In OMR Sheet For 100 Questions And Duration Of 2 Hours. Chennai Metro Water Assistant Engineer Exam Pattern of Written Exam : The CMWSSB Syllabus & Exam Pattern are important aspects of knowing the structure of the Written Test. The Written Test consists of Multiple Choice Questions of Different Sections. To use blue or black ink Ball Point Pen only. Answer sheet will be invalidated if shaded in Pencil. The answer sheet will be invalidated if the box for Booklet Series is not shaded and could not be identified even by physical verification of the answer sheet. Post wise exam pattern are given below tabular form. CENTRES FOR EXAMINATION : CMWSSB Jr. Assistant Written Examination will be held in the month of March/April 2017 at Chennai, Madurai, Trichy, Coimbatore, Salem exam centers. CMWSSB Assistant Engineer Syllabus are uploaded on our website to download for free. The aspirants who have applied for Chennai Metro Water Recruitment 2017 will be in searching for the Chennai Metro Water AE Junior Assistant Syllabus can get it here for free in a pdf format. So, the candidates can utilize these CMWSSB Syllabus during the preparation of CMWSSB Assistant Engineer Exam 2017 to get a decent score in the Chennai Metro Water AE Examination 2017. The Chennai Metro Water Assistant Engineer Exam Syllabus covers the topics like as, Civil Engineering, Mechanical Engineering, Electrical Engineering, General Knowledge, Finance, Accounting, Aptitude. Business Laws/Corporate Laws with Emphasis on Companies Act, 2013. Income Tax Law and Practice/Corporate Tax Planning/Indirect Taxes. Projects, options, working capital management, risk mitigation, strategies in general. Auditing with special emphasis on accounting standards. Financial Markets, Institutions, and financial services. Download CMWSSB Assistant Engineer Previous Papers : Here we have also uploaded the Last five years Questions Papers of Chennai Metro Water AE Junior Assistant Exam 2017 in a pdf format for free download. So, the candidates who are preparing for the CMWSSB AE Exam 2017 can download these provided CMWSSB AE Junior Assistant Previous Papers in a pdf file from the link given below. Conclusion : Chennai Metropolitan Water Supply and Sewerage Board is going to conduct competitive written test for 322 CMWSSB Post. 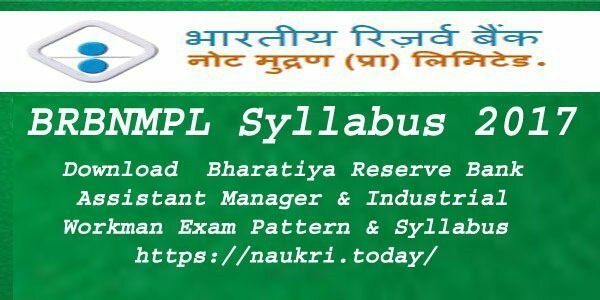 Candidate should download CMWSSB Syllabus 2017 | Chennai Metro Water Assistant Engineer Exam Pattern Preparation Guide from here. can you please share the previous year question paper for AE- Electrical? 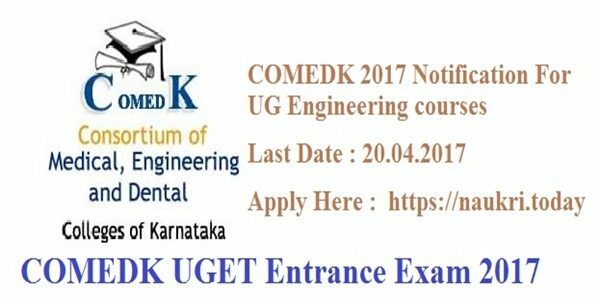 Can you send more model papers for assistant engineer- Electrical? Can anyone provide me Model Question JA?? Need for old model question paper mechanical AE exam please help me sir..
Model paper are providing in this article. You can read this post carefully then get mode paper & previous Paper at then end of this article. Ji u know the complete details about wait scheme..?? I need AE post ECE Dept syllabus also previous model question paper. who can apply junior assitant ? Could you send me the previous years question papers for CMWSSB Assistant Engineer Electrical position. can a final year student apply for this exam?? ?